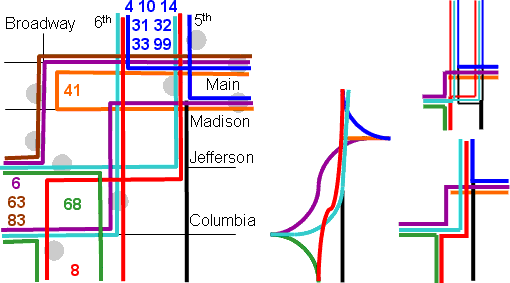 Diagram of former TriMet bus service through the area of Main/Madison / Jefferson/Columbia Streets and 5th/6th Avenues / Broadway. Grey circles represent bus stops; only lines which touch them serve them. The diagrams at right show simplified/abstract views.